The Price Ladder Training course was developed to cause a paradigm shift in trader development, by providing a platform for traders of all experience levels to rapidly hone the invaluable skillset of reading order-flow in the financial markets. By training in how to read order-flow, our ultimate objective is to create the next generation of great traders. 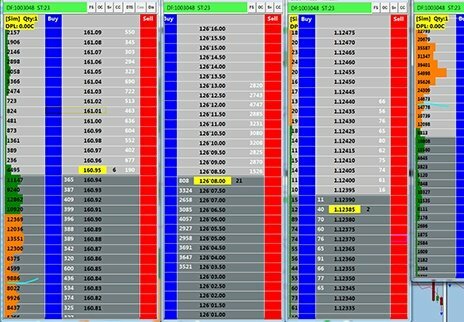 With our intensive Trading Drills, the programme utilises years of trading experience to accelerate your understanding of how to trade order-flow patterns. The programme has been created so that it exposes you to the fundamental elements of the market; buyers and sellers. It is geared towards accelerating your learning curve in the art of basic of order-flow and also the science behind trading the most volatile risk events, in order to profit from them. We have worked diligently over time to develop one of the most innovative products in the field in order to accelerate a trader’s learning curve. I think the course gives the tools to develop one’s own strategy based around the market profile. You have to take the strategy taught and then adapt it for what works for you. The course went on to exceed all expectations. The class size was beneficial as I really feel we all got very close attention and tuition. Along with the morning stream, which was amazingly beneficial to really see and understand how Dan thinks and sees the market. The market profile sessions were of major benefit as were the open Q&A sessions that are scheduled into the programme. Any questions left unanswered? We’re happy to talk. Contact us today to speak to a friendly advisor or email us as below and you’ll hear from us soon after. To receive your free taster video please e mail d.goldberg@tradertraininghub.com & you will be sent details how to view.